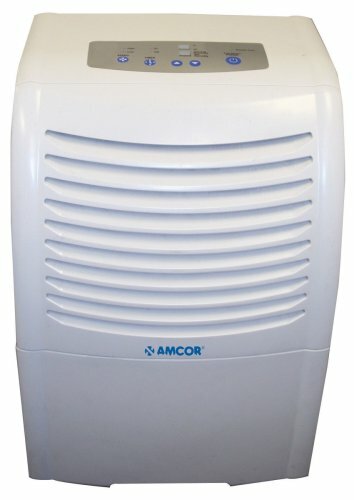 The Amcor AHD65 Dehumidifier can provide continuous dehumidification because it can be continuously drained through a hose. Of course, if you don't want to use the included drainage hose, this dehumidifier can drain to an internal bucket, and it will automatically shut off once the internal bucket fills. This powerful dehumidifier is ideal for basements and removes 65 Pints of moisture from the air per day. Its features include a washable air filter for easy maintenance, R-22 refrigerant, a full tank warning light, a 2-speed fan, a 1-24 hour timer for your convenience, and more. In addition, this practical dehumidifier has been Energy Star rated to ensure energy efficiency - cutting down your electricity costs. Dimensions: 14 1/2"H x 13" W x 22 1/2"
The hose that came with the unit to drain the tank was very flimsy and leaked at the connection. While the connection appeared to be able to fit a standard washing machine hose, it was impossible to tighten it because the opening in the bottom was too small. We ended up affixing plastic drainage tubing directly to the nozzle and tightening it up with a hose clamp, then running that out through the hole in the bottom, bypassing any drainage into the tank completely. In just 3 weeks of use, the handle on the water basket broke loose and can't be reinstalled. So far, no response from the manufacturer. The unit removes a lot of water, but heats up the room much more than the Kenmore that it replaced. Based on these results, I regret the purchase and cannot recommend it. I received the Amcor AHD-65E July 16 and, having already read the manual online, immediately removed the unit from its packaging and plugged it in to try it out. The dehumidifier beeped and the "BUCKET FULL" light flashed and then remained lit. Per the owner's manual I removed and reinserted the bucket (repeatedly, and with various time intervals between steps), but the light stayed on and the machine would not work. I emailed Amcor that night but, despite their efforts "to respond to all e-mail inquiries within 48 hours of receipt," I have received no reply now seven days later. July 19 I called Amcor technical assistance and, after a reasonable wait, I spoke with Keith. Keith was polite and tried to help, but I had already followed the instructions he gave me to get the dehumidifier running. He suggested that I could return the newly purchased machine, but I opted to have someone from the corporate office contact me. I supplied my phone number and email address. Keith said I could expect that reply within three business days. A product that does the job!